Discover an innovative voice in Catholic art. Jennifer Primosch is proud to come from a multicultural family. She is related to people from nearly every continent, and she remember relatives joking that family photos made them look like the United Nations. Jennifer's family members were active parishioners at St. Aloysius Roman Catholic Church in Queens, where she also attended the church's parochial school from K-8. The parish was and still is home to many ethnicities. Going to church was mesmerizing. Angels greeted the worshippers from every angle. However, at some point, Jennifer realized that the images of all of the religious figures did not represent all of the people she knew and loved. While in school, she received the Good News Bible, written in plain English, which she proceeded to read cover-to-cover. This version also provided historical maps of the Bible's events. While reading the ancient texts and comparing the maps, Jennifer realized that not only did common religious iconography not represent people she knew, it didn't represent the people in the Bible either! A seed was planted in her nascent artist's mind, and she began thinking about how to create art that was more accurate. 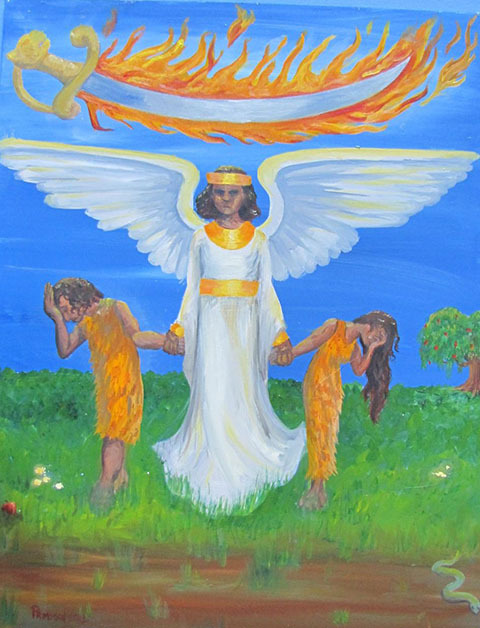 As Jennifer grew older and became an art student, she learned to use visual references and began to depict her own angels as Jewish people of Middle Eastern and North African descent. Eventually, as an adult, she took a life-altering trip through the Holy Land from Egypt through Jordan to Israel. There, she learned from Middle Eastern and African Christians that European artists imagined everything from a specifically European lens, versus from what the Middle Easterners knew living in the region. She learned that it was accepted in the Middle East that Abraham was likely a Bedouin, as were the shepherds in the field to whom the Angels brought the news of Christ's birth. Jennifer stood in the cave where Jesus was born while her Palestinian Christian guide told her that the image of a wooden stable was incorrect; family animals were always kept in the cave, which served as the ground floor or basement of the stone homes. This made Jennifer rethink how she visually conceived of the events of the Bible. Her artwork further evolved, and she resolved to continue my research. As she became a professional artist and art educator, other elements of her artistic style became popular, and her "angels" settled into her personal work, rarely seen outside of her home or family. 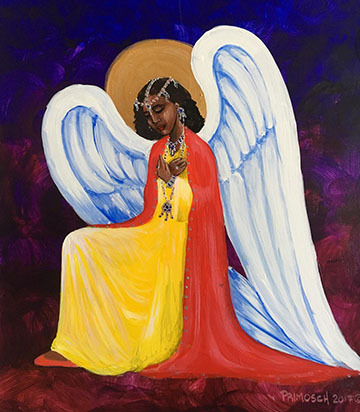 Then, friends and family members of color who saw her work on the walls at home began requesting that she put her paintings on Christmas cards for them to send out. She began putting these images on her website and producing cards to sell to individuals and online. Soon friends of friends and family of friends began purchasing cards and prints. Jennifer's work brings a freshness to religious art that reflects the modern family, which is becoming increasingly culturally blended. Her work visually reflects the inclusiveness that the church has always strived for in its congregations. When worshippers feel included, they are more inclined to be active members.